In this article, we will look at why record keeping is one of the key responsibilities of a small business owner and what happens when there is no systematic or coordinated record keeping. From the moment you start your business every piece of document should be kept. Even your preliminary business expenses those relating to the setup and even if you make a loss in the first year. All documents that arise in the course of your doing business should be kept and here are the main reasons. To provide source documents for accounts. Accounts data becomes information that helps in the decision making. Once information about your income and expenses has been captured financial statements can be prepared and profitability can then be assessed. Depending on the results key strategic decisions such as whether you should expand or shelve certain projects can then be made. Audit occurs when for some reason the information you have claimed or attested to in your financials needs to be verified by a person or persons external to your business to validate your claims. Some industries have a mandatory requirement for auditing of financial and other records. In an audit, any claims you may have made for income or expenses can be denied if there are no source documents to validate your claims. Without any prior knowledge of your business your records should create an audit trail that verifies your claims. For instance, If you have received an amount of $10000 there should be a valid invoice as well as in some cases a sales and quote supporting the claim. These records are known as the source documents and they create an audit trail that can be verified. Similarly, if you are claiming travel expenses of $50000 for your business there should be a supplier invoice that validates this claim. A line on your credit card statement is not a proper record or basis to claim a creditable purchase. In Australia, it is a legal requirement to keep business-related documents: 7 years for employee-related wage records and 5 years for business tax records. Other industries may have other recordkeeping regulations and different timelines such as minutes of meetings and certain registers for example. For a business, records can include day to day supplier invoices, sales invoices and customer records and some agreements and contracts. Licenses, proof of registrations or permits and other industry-specific records, are also a requirement in some industries. Specifically, for invoices (less) <$1000 the following should be clear. If the supply is mixed that is where some components include gst or are gst free this should be clear on the invoice. Your invoice should clearly state where there is no gst. Some businesses use an asterisk to indicate gst in a particular line item. n.b Where the sale is greater than $1000 the buyer’s identity should be clear. To be able to support your claims for deductions on income earned when getting your income tax return or BAS done your claims may be refused if enough backup documents are not provided. Records of your performance or your financial statements are the basis upon which your income tax returns are prepared. Separation of business from non-business expenses. Good record keeping will help authenticate your claim for business deductions. The business portion should be clearly defined for instance if you claim motor vehicle fuel expenses you may need to keep track and record of your business-related km to validate your claim and in cases where you need to prove your expenses were business related. Consider using digital data capturing programs such as HubDoc, Receipt bank, Dropbox, EFile Cabinet, Digital Drawer, Box or File Hold. E documents do not fade although do make sure that the method you use has sufficient contingency planning in the form of backups to avoid losing data. In addition, digital entry is virtually error-free data entry and you can be sure to have better quality information as Garbage in equals Garbage Out. Increase in efficiency and reduction in costs from organised record keeping. Accountants are likely to charge less for more organized document management versus shoe boxes of receipt. Verify the ABN of the entity. Know who you are buying from and remember it is your legal right to receive a tax invoice. Without a tax invoice, your purchase will not be considered a creditable expense and you cannot claim back an input tax credit or gst. The Australian Tax office has guidelines on what actions to take where no ABN is provided you may visit www.ato.com.au for more information. Keep a good record of what you have paid for by doing bank reconciliations. If you are reporting GST on a cash basis you can only claim GST or an input tax credit on what you have paid. In addition, under the cash basis, you will need to pay Gst on sales you have received money for. It is important to have proper records of this so that you will not be penalized. Do not claim Gst or an input tax credit if an entity you are dealing with is not registered for Gst. What happens if you do not keep proper records. 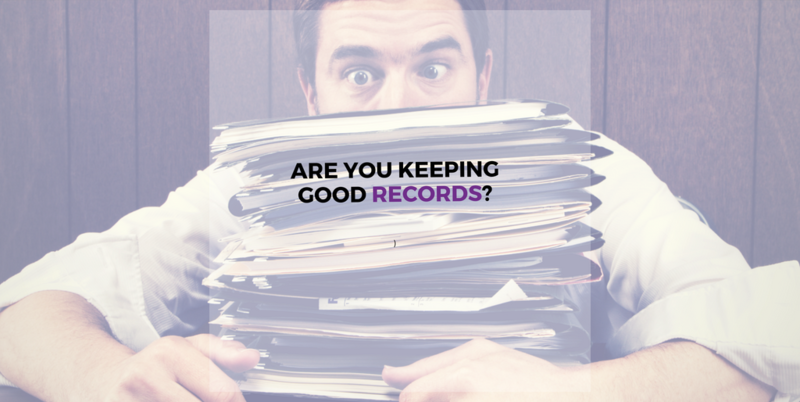 Not keeping proper records can lead to audits and penalties. Not recording income or expenses fully can lead you to be overoptimistic or underestimate your growth as a business. If you are not recording income correctly you may be underestimating your value. This can affect your businesses sales value if you decide to sell your business or if you need a loan. Most loan amounts or pre-approval will look at your earnings or potential earning based on your historical earnings. Evaluate your record keeping with the ATO’s record-keeping evaluation tool. If things are out of control do seek help. Your bookkeeper or accountant can help you create a system of data capture that will help you run your business efficiently, compliantly and improve your decision making. 8 Common Gst Mistakes …and how to correct and avoid them.